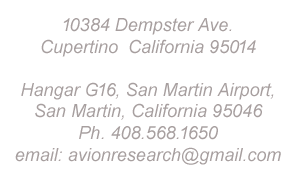 Avion Research is located in Cupertino, California and visitors are always welcome. If you have questions about our services, pricing, returning your aircaft to service or approvals, please call (408) 568-1650 and ask for our Engineering Director. We offer many services, available through your avionics shop or maintenance facility and we are happy to discuss any questions you have.